Wow does time fly. Don’t you love how I said I was going to blog every day last week and then I disappeared? Yeah, me too. The struggle is real. So we’ll just pretend that didn’t happen because I have to tell you about Mockingjay Part 1! 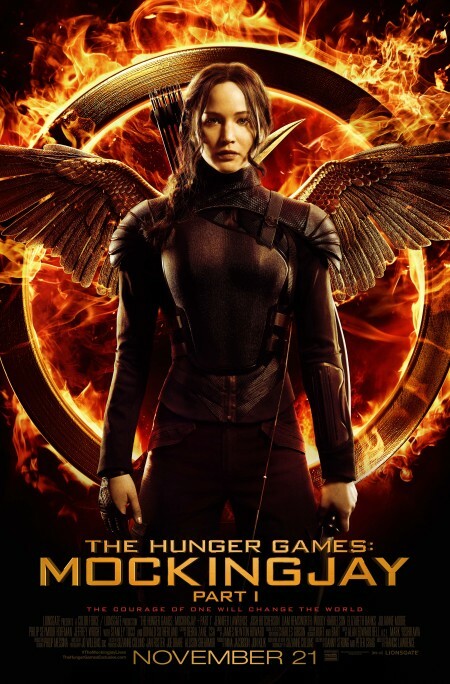 Tuesday night I had the chance to screen Mockingjay, the first of a 2-part finale to the Hunger Games series. To be fair, I didn’t love the final book for a few reasons. I didn’t hate it either so going in, I was just trying to enjoy the theater experience. I do love some Katniss and Peeta and I thought they did a great job telling their story throughout the movie. Because this book was split to make two movies, I knew I would leave wanting more. However, knowing the story, I thought they chose just the right point to end part one and I am really looking forward to part two. The action scenes were definitely the highlight of the film and we have much more of that to look forward to next year. By far, my favorite scene was hearing Katniss (Jennifer Lawrence) sing over a montage. Girl has some skills! I loved her voice and the song was a perfect fit at the perfect moment. I am being intentionally vague here because you just need to go see the movie. If you are a Hunger Games fan already, I don’t need to tell you that because you are probably in line right now. If not, borrow The Hunger Games from your niece, stream Catching Fire on Netflix, and check out Mockingjay on Thanksgiving. It’s a solid plan! Ha! I pretty much said the same thing about her singing in my review.